Free shipping. Buy direct from HP. 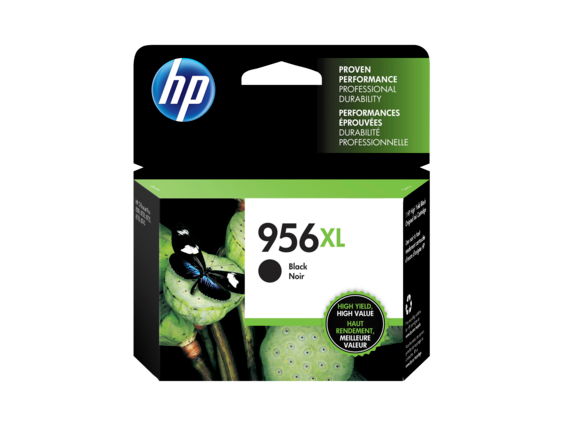 See customer reviews and comparisons for the HP 956XL High Yield Black Original Ink Cartridge. Upgrades and savings on select products. Get up to 3x the pages with Original HP XL inks vs. standard cartridges. Count on professional-quality documents. Original HP ink cartridges provide impressive reliability for dependable performance, consistent page yields, and standout results. Quickly print with individual inks and high-yield cartridges. Original HP ink cartridges are specially designed to work with your HP printer or all-in-one.Easily replace cartridges and tackle high-volume print jobs with Original HP ink cartridges.Ensure outstanding performance and high-quality results at fast speeds with HP proprietary inks. Consistently produce professional-quality black text, using pigment inks designed for the office.Produce water-, smear-, and fade-resistant prints. Print sharp black text on a variety of papers—including ColorLok® papers—with Original HP ink cartridges.Print reports, emails, proposals, and other business documents on a variety of papers. Print affordably with individual cartridges. Simply replace each cartridge separately, as needed.Print 3x more pages and replace cartridges less often, using Original HP high-yield ink cartridges. Save time with HP SureSupply. Receive notifications when cartridges are running low for quick ordering. Complete your page even with a low-ink-level cartridge. Easily recycle your Original HP cartridges at no charge through HP Planet Partners. Through the Design for Environment program, HP engineers products to be energy efficient and recyclable.Conserve resources—Original HP ink cartridges are shipped in streamlined packaging. Consistently produce professional-quality black text, using pigment inks designed for the office.Produce water-, smear-, and fade-resistant prints.Print sharp black text on a variety of papers—including ColorLok® papers—with Original HP ink cartridges.Print reports, emails, proposals, and other business documents on a variety of papers. Print affordably with individual cartridges. Simply replace each cartridge separately, as needed.Print 3x more pages and replace cartridges less often, using Original HP high-yield ink cartridges.Save time with HP SureSupply. Receive notifications when cartridges are running low for quick ordering.Complete your page even with a low-ink-level cartridge. Easily recycle your Original HP cartridges at no charge through HP Planet Partners.Through the Design for Environment program, HP engineers products to be energy efficient and recyclable.Conserve resources—Original HP ink cartridges are shipped in streamlined packaging.